For decades, the timber at the headwaters of Pescadero Creek, located just barely within the limits of Santa Cruz County, were harvested and lumbered for various logging concerns. Oil Creek was harvested in the 1890s and Waterman Creek from 1903 to 1913. Then things went very quiet. 12,000 acres of old-growth redwood remained untouched along Pescadero Creek, timber acreage that had inspired the Felton & Pescadero Railroad's very name in 1883. No railroad would ever connect this territory to the outside world. But a railroad was built all the same. Main mill pond with track at left, 1949. Photo by John Cummings. In 1923, the Santa Cruz Lumber Company was founded by George Ley, who had purchased most of the timber north of Pescadero from the Henry Cowell family. 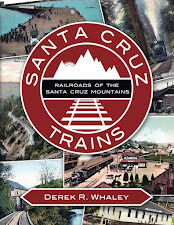 Near the headwaters of the creek and on the county line of Santa Cruz and San Mateo Counties, Ley built the Waterman Gap Mill, which was accompanied by a large mill pond and inclined tramway to connect the facility to the main County Road just to the east (modern-day State Route 9). The mill had a capacity of 60,000 board feet per day and operated via steam power. It employed up to 85 men in the 1920s, although by the 1970s the number had dropped to 50. The engine shed and water tower for the locomotive. Mill in ravine at left, January 7, 1950. Photo by Richard C. Brown. 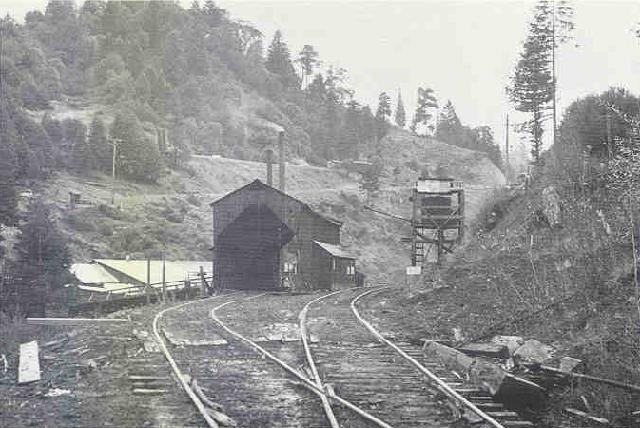 For the first decade, Ley harvested the lumber around the mill, creating areas for lumber storage, an expanded tram system, and better roads to ship the wood to Santa Cruz. 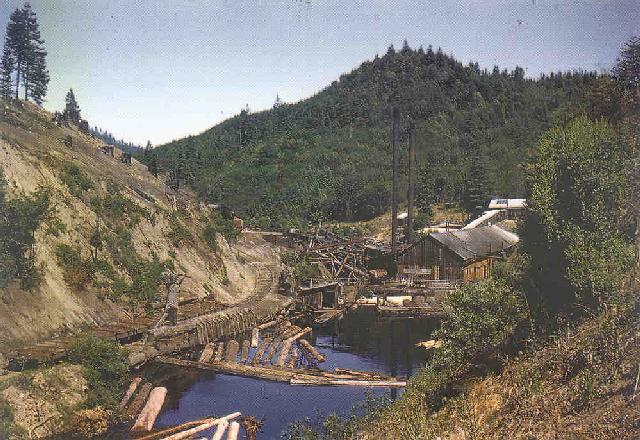 Chutes were installed above the mill to slide and drag lumber to the mill pond from the hills. 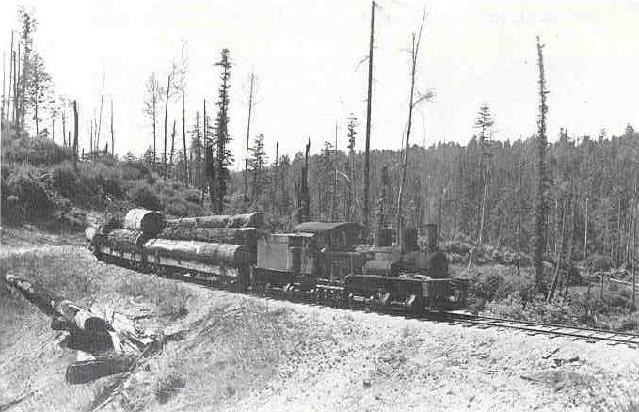 Ley used trucks operating on service roads to haul the lumber to Boulder Creek for railroad shipment (until 1933) and then to Felton. Since the Dougherty Extension Railroad was pulled in 1917, there was no railroad access north of Boulder Creek at the time Ley ran his mill. By the 1930s, all of the area within reach of the mill had been harvested and a decision had to be made on how to get the timber from further afield to the mill at the top of the grade. On March 31, 1930, Ley purchased a 42 ton standard-gauge Shay locomotive from the San Joaquin & Eastern Railroad, as well as a few flatcars for use on a private isolated railroad that he envisioned running between the mill and alongside the creek to the west. It was designated SCLCo. No. 2, taking its number from its former owner. The truck was trucked to the top of State Route 9 and then hauled to the mill overhead via cable lines. At the same time, a small track was built beside the mill where the locomotive would be reassembled for operations on the line. The track was constructed with truly ancient metals—some dated to 1881. The main track ran opposite the mill and slightly above it so that it could dump logs directly into the mill pond. Beside and above the mill, a one-stall engine house was erected for storage and repairs of the locomotive. Only a single siding was installed, serving as a runaround for the engine house. The fuel tank and water tower were installed just opposite the house on the siding. 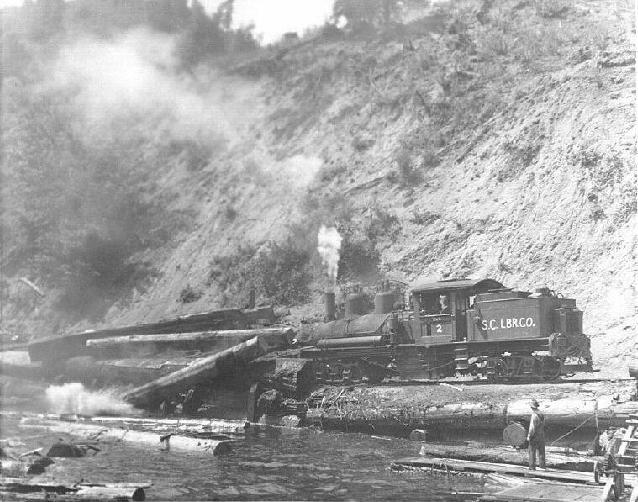 The lumber train running down the track to the mill, 1947. Photo by Jack Gibson. In the early 1940s, the flatcars were destroyed in a wreck along a steep logging spur lower in the valley and six new flatcars were purchased from the Yosemite Valley Lumber Company. This new fleet of flatcars were sturdier and stronger so could withstand more abuse. A Southern Pacific tanker car was also purchased around this time for unknown uses. As the track was ever extended downhill alongside the creek, a few short spurs were added and removed and grades of up to 6% were attained to reach some of the more troubled spots. 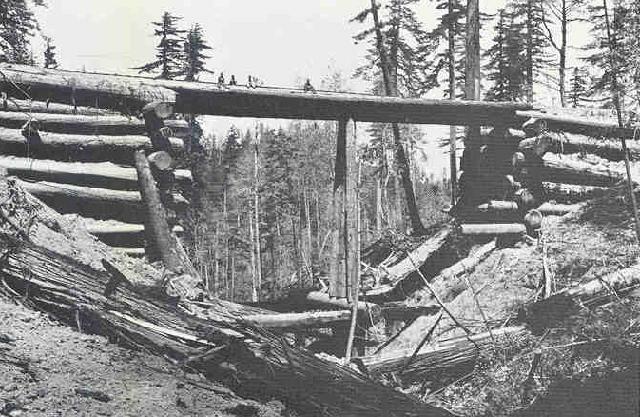 Bridges were built primarily out of stacked logs and, while massive in size, were still ofttimes precarious. By 1950, the railroad extended nearly 8 miles to just outside the YMCA camp at San Mateo county Memorial Park. A makeshift passenger car was created at some point in the 1940s to ferry lumbermen from the mill to the end of the line. A water tower was also installed mid-way down the route. The train dumping lumber into the mill pond. Engine lettering added by photographer. Photo by Fred Stoes. The railroad never made any connections to the outside world, unfortunately, and was doomed before it even began. Large freight trucks were already becoming popular in the mid-1920s and by 1935, Catepillar tractors were brought in to assist in the logging operations. In 1945, the road to State Route 9 was properly graded so that trucks could regularly access the mill for exporting lumber. Then, in the summer of 1950, the lumber company's timber harvesters had finally reached the top of the summit ridge. While the company still owned extensive lands on the opposite side of the summit, there was no way of getting the train over there cheaply. 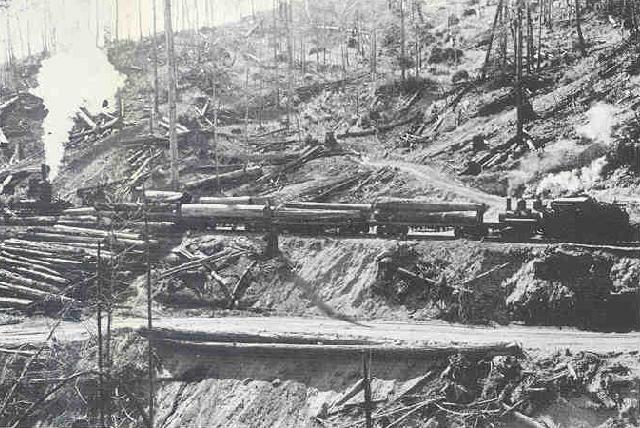 Santa Cruz Lumber Company decided to tear up the rails and roadbed and convert it to a truck road. The locomotive and cars were stored until 1954 when they were scrapped. The mill itself was scrapped in 1955 and rebuilt into a modern facility. Santa Cruz Lumber continued to operate along Pescadero Creek until 1972, reorganising the remaining 7,079 unharvested acres of redwood forest as Pescadero Creek Tree Farm. The company closed in 1989, selling its assets to San Lorenzo Valley Lumber Company, while its properties were transferred to Redtree Properties Ltd., which is still owned by the Ley family today. Access to the mill site is trespassing, unfortunately, since there is still quite a lot of material left on the site. By the time the mill closed, a full planning mill appears to have been in operation there. The route of the track mostly followed along the south bank of Pescadero Creek from the mill site to Jones Gulch. While the precise route of the track is not certain, many believe and assume that Old Haul Road, which begins at the junction of State Route 9 and State Route 236 is more or less the railroad grade. This road is legal to use, although it is very remote and 4-wheel drive is recommended. The grade passes into Portola Redwoods State Park, passing beside Pescadero Creek Park, ending just east of the junction of Pescadero Creek Road and Wurr Road near YMCA Camp Loma Mar. Ennis, Dwight. "The Real Santa Cruz Lumber Co". The Santa Cruz Lumber Company Garden Railroad. Milpitas, CA: 2002. You will find more information on this railroad in the Western Railroader issue Number 450, Volume 41, of January 1978. Like what you see? 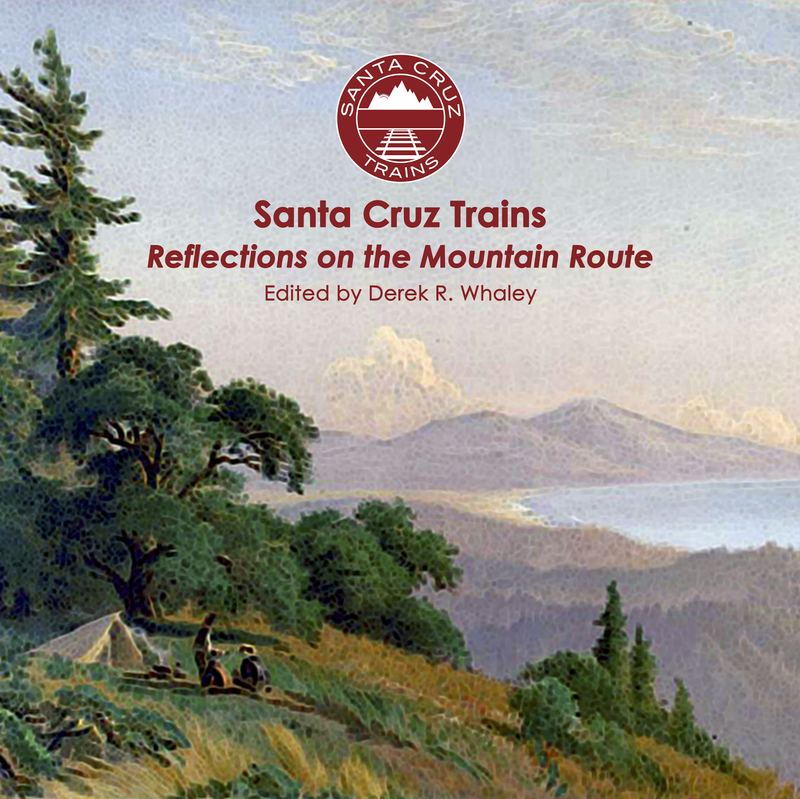 Please consider donating so that this site can continue exploring the history of Monterey Bay railroading. Copyright © 2012-2018 Derek R. Whaley. All rights reserved. Picture Window theme. Powered by Blogger.